According to a new report by analytics firm Ooyala.com, we are watching more video on our tablets than on desktop computers these days. To be exact, the report suggests that we’re now watching around 30% more video on tablet devices than on desktop computers. The report is based on quite a bit of data, too. Ooyala.com used over one billion analytics to come to the conclusion that was outlined in their report. 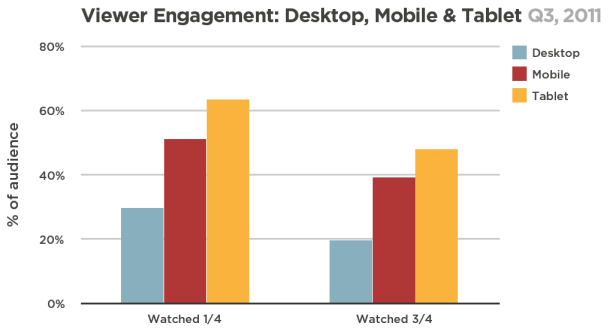 Equally as interesting is the news that users who watch video on their tablets are twice as likely to watch the entire video than those on desktop machines. These videos aren’t short little two-minute YouTube clips either, 55% of the video watched on a tablet being of ten minutes or longer in length. Apple’s iPad was the most popular tablet for viewing online video during the third quarter, accounting for 99.4% of displays and 97.7% of total plays. 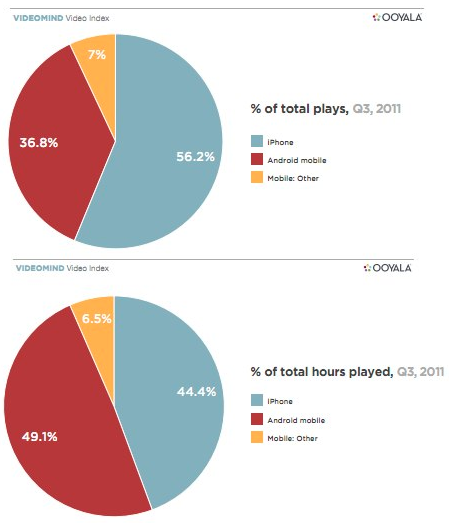 iPhones accounted for 56% of video plays, while 36.8% for Android-powered smartphones. However, Android beat out the iPhone in total video minutes, delivering 49% to iPhones 44%.